Socialist Solidarity - Kerry Badgley's "The United Farmers of Ontario"
Kerry Badgley's "The United Farmers of Ontario"
Kerry Badgley, "Ringing in the Common Love of Good": The United Farmers of Ontario, 1914-1926 (Montreal and Kingston: McGill-Queen’s University Press 2000). In Spring 2001 thousands mobilized to protest the Free Trade Area of the Americas conference in Québec City. Following the "battle in Seattle" in 1999 and protests in Europe, a new anti-capitalist current has arisen. It is a current that includes some inspired by democratic socialism, but mostly includes a new generation inspired by some form of populism, radical liberalism open to refinement as either anarchist or socialist. Kerry Badgley’s study of the United Farmers of Ontario (UFO) seems a long way away from Seattle or Québec, but his study of rank-and-file populism is clearly linked to the debates of the new activism. 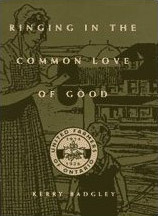 In particular, Badgley focuses on the radical experimentation of Ontario farm progressives in co-operation; the development of an autonomous farm women’s movement (the United Farm Women of Ontario-UFWO); and the rise and fall (due to the hegemony of traditional forces and a conservative UFO leadership) of an independent UFO politics through a brief provincial government (1919-1923); and the election of 24 federal MPs in 1921. To give force to his positive evaluation of the UFO experience, Badgley examines rank-and-file members in three counties: Lambton, Simcoe, and Lanark. There are a number of positive features about this study. It is the first to seriously address the local dimension of the farm progressive challenge to Canada’s bourgeois elites – through co-operative enterprises, the church union movement, and moral debates about prohibition; as well as from a spontaneous revolt against military conscription in 1917 - to develop an independent politics breaking from the parliamentary clientelism of Conservatives and Liberals. This emphasis on the local has the merit of stressing how central self-activity and self-organization were in creating the energy and force to challenge bourgeois norms. By studying the UFWO and the many local farm co-operatives, Badgley also does a valuable service in stressing that farm progressives had a substantive radical practice that went beyond the more short-lived and contradictory politics of the UFO. What is also to be welcomed is Badgley’s sharp posing of the arguments about the meaning of the farm progressive movement then and now – the first mass break from bourgeois politics in Canada and the relevance of direct democracy to any radical project today. In Badgley’s opinion, the UFO movement was "unconsciously anarchist." For Badgley, what activists today can do is make the core political principles of the farm populist experiment a conscious challenge. From a Marxist point of view, and as someone who has studied the UFO through the leadership of W.C. Good (one of three key figures in the movement along with E.C. Drury, farm premier, and J.J. Morrison, provincial co-operative secretary), there are a number of points for debate. First, Badgley’s account of the rise and fall of the UFO as a means to examine local organisations in Lambton, Simcoe, and Lanark needs to be contextualized. Where does it fit with C.M. Johnston’s account of the UFO government or the stories of the United Farmers’ Co-operative Company and the Ontario federal farm progressive caucus from the Good study? How did local UFO mobilization link with election results? (Appendix R) There is a powerful dialectical relationship between rank-and-file action and provincial leadership and structures; one cannot be examined without the other. Secondly, Badgley appears to have omitted what populist choices existed to define local radicalization The central interpretive argument about UFO leadership from the Good study is that there were three (not two) currents: a reform from above argument by E.C. Drury about making the UFO a people’s party within existing market and parliamentary rules; a radical reform from below argument by W.C. Good to extend direct democracy methods in co-operation to politics through the single land tax, free trade, and a transformed parliamentary system through a variety of direct democracy reforms like proportional representation and the single preferential ballot; and thirdly, a purely negative, sectional argument by J.J. Morrison for occupational self-defence through narrowly conceived co-operative action. Arguably, it was Morrison who triumphed as the sole leader remaining after 1926. Yet Badgley’s accounts of local activist initiatives in co-operation and politics appear to illustrate all three of these tendencies as well as confirm how economically and socially representative UFO membership was. If anything, his local studies confirm anecdotal evidence in leadership studies about the importance of the single land tax to the most radical populists, the relative youthfulness of UFO activists, and the importance of pro-Union Presbyterians influenced by the Social Gospel. Another contextual question is: why choose Lambton, Simcoe, and Lanark Counties? Badgley offers two reasons: their geographical representativeness and available evidence (the degree of local organization in Lambton, the only extant club records being for Simcoe, and the number of local papers in Lanark). However, as noted in the Good study, from a farm production system point of view, there were four regional farm economies in Ontario: the dairy belt (divided between eastern and western Ontario – Lanark being in the first); a mixed livestock system (Lambton and Simcoe); a few specialized areas such as the fruit farmers of Niagara or Prince Edward; and the agro-forestry system of Northern Ontario. The selection of local studies can be refined and tested further. Thirdly, what about interpretation? Badgley does a good job in summarizing how Ontario historiography has marginalized this mass, radical challenge to its dominant political culture. But he has to simplify the Marxist narrative and critique to deny there is a meaningful organizational and social context for local responses, which included all tendencies – from Simcoe County’s F.W. Webster and his explicit mention of anarchism to argue for reform from below single land tax and electoral reforms, to the mainstream co-operative and political practice of most Simcoe UFO members who were led by E.C. Drury locally, to the negative sectionalism of Leslie Oke and the Lambton farm co-operative association. Despite these criticisms, this is a valuable book for two reasons. First, the Ontario farm progressive challenge was a radical, mass break from Canadian capitalist politics. The farmers’ achievement is well worth repeated, careful study from a variety of points of view.